This impact story was published by Etta Projects. Learn more about us, or see the lives we've changed! This is a story of inspiration. It began 102 days ago when two siblings, Gus and Elena Wimberger, set off to hike the PCT. They hoped to add meaning to their journey by using their experience to connect people like you to families in need in Bolivia. Along the way, they inspired you to contribute to a school garden in the rural village of Santa Teresa. Your contribution inspired the students and teachers of Santa Teresa to harvest fresh vegetables, sell them to local families and earn a small income for the school. The work of the students and teachers in Santa Teresa inspired a community member, Señora Miriam, to get involved, support the school garden and even begin her own garden at her home. The work of Señora Miriam is an unexpected, positive outcome of this story. She is a 49-year-old women who lives in extreme poverty in the village of Santa Teresa. She saw the school garden as an opportunity to improve the health and nutrition of her community. She works hard every day in the garden and helps it to grow and flourish. With Miriam’s support, Santa Teresa now has the largest garden of all the participating schools. She even took her knowledge from her work in the school garden to start a garden at her own home. Miriam is now an example of leadership in her community. She is a unique outcome of the chain of positive impact that has occurred since Gus and Elena embarked on this journey. Thank you for being an important link in this story of inspiration. On behalf of Etta Projects, Gus & Elena, the students & teachers of Santa Teresa, and Señora Miriam — we thank you!!! P.S. 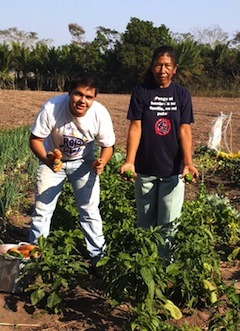 The picture is of Señora Miriam and Etta Projects’ Agriculturist, Rodrigo Paz, at work in the school garden!